We will apply the five steps to PLC program development to a sorting station example. The program will use shift registers to track coloured parts down a conveyor and sort depending on colour into one of three locations. Developing the PLC program is a process that can be clearly defined. In our series on the five steps to PLC program development we have done some similar practical examples. A normally open start and normally closed stop pushbuttons are used to start and stop the process in automatic mode. 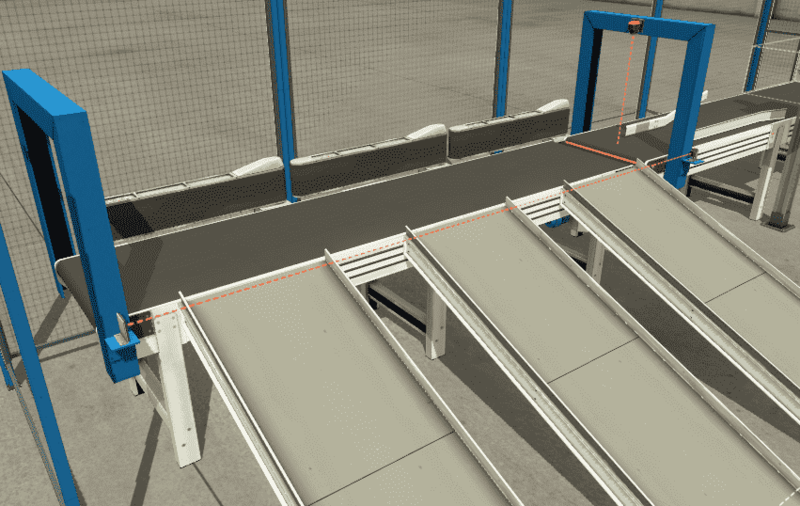 Upon starting the entry, exit and sorter belt conveyors will turn on. This will bring parts to the vision sensor. The sorter for the exit ramp will turn on allowing the part to slide down the exit ramp. 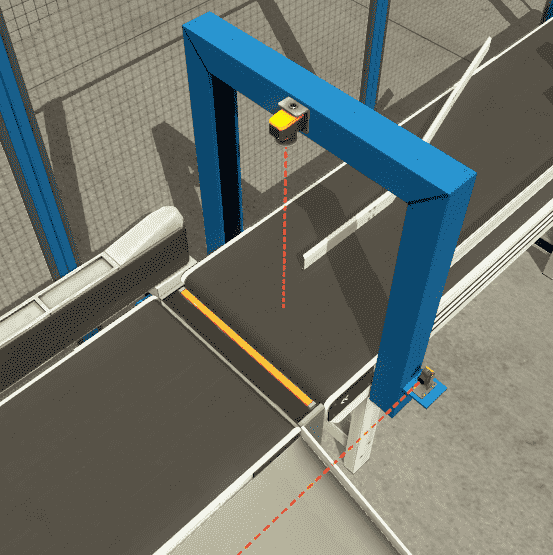 To reset the tracking of the parts and clear the conveyors, hit the reset button when the machine is stopped. If a part is stuck on the exit sensor to the ramp, this will block the sensor. A delay of 5 seconds takes place and then the machine will stop. The flashing reset button will indicate that a jam has occurred at the exit. What happens when electrical power and/or pneumatic air is lost? What happens when the input / output devices fail? Do we need redundancy? This step is where you can save yourself allot of work by understanding everything about the operation. 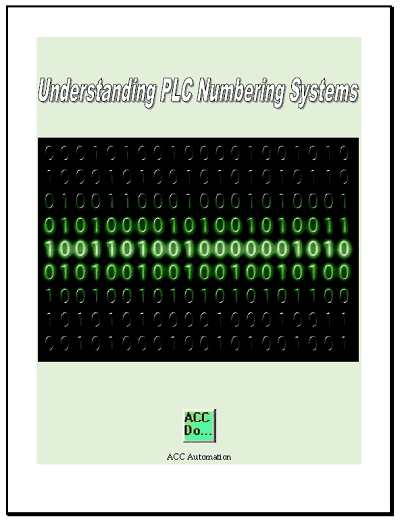 It will help prevent you from continuously re-writing the PLC logic. Knowing all of these answers upfront is vital in the development of the PLC program. 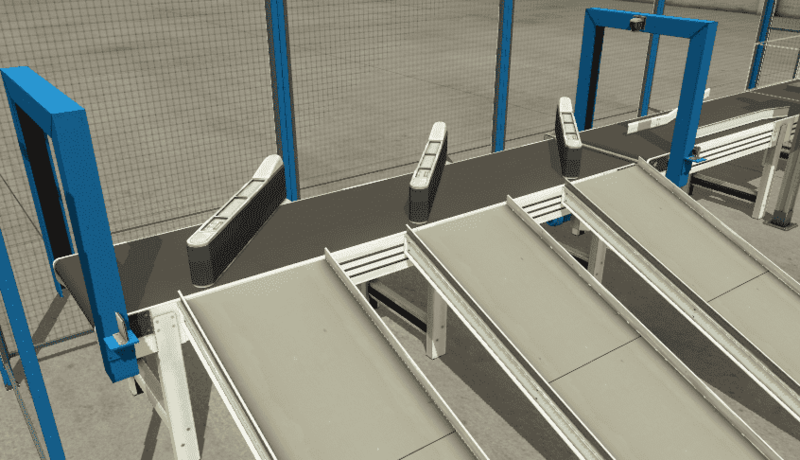 The main part of the program will be to track the parts down the conveyor belt. Using a shift register on each of the exit ramps is a good way to do this logic. In our example we do not have an input to represent movement on the conveyor belt. This would be like a proximity sensor on a sprocket or an encoder on the conveyor shaft. We will accomplish this by using a system timed bit. (100ms interval) When the conveyor belt is running we will trigger our shift register every 100ms. This will act as the clock input to our instruction. Each 100ms pulse of the bit will indicate a movement of the conveyor belt. The first thing in our program is to control the start and stop functions. This is done through a latching circuit. Start the conveyors in the system. This is done with the start light bit. The three sorting ramps are tracked by their own shift register. The colour sensor on the input (MHR1) will determine the colour of the product. Based upon the colour the product will be sorted into one of three ramps. The clock input to all three shift registers will be the start bit along with a 0.10 second system clock bit (100 msec). Normally this would be off of a conveyor pulse bit that would represent a distance travelled by the conveyor. Example: Gear turning triggers a proximity sensor. Reset on the part tracking (shift registers) is done with the reset button when the system has stopped. If the colour sensor picks up a 0 or 4 this is a base unit. It will then put this as an input to the shift register. The output will trigger the sorter 1 turn mechanism. If the colour sensor input is greater or equal to 2 and less than or equal to 3 this is a blue part unit. It will then put this as an input to the shift register. The output will trigger the sorter 2 turn mechanism. If the colour sensor input is, greater or equal to 5 then this is a green part unit. 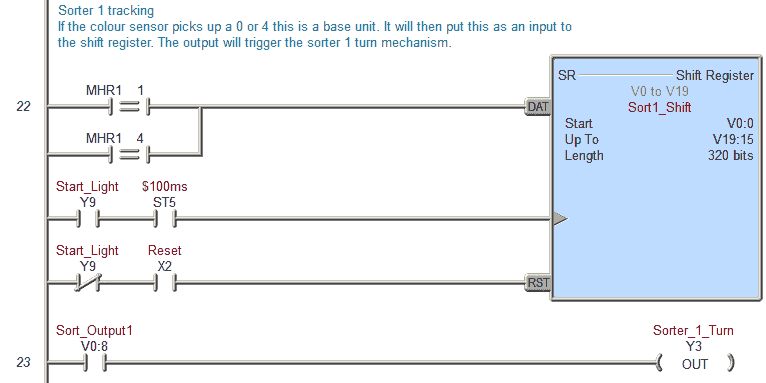 It will then put this as an input to the shift register. The output will trigger the sorter 3 turn mechanism. 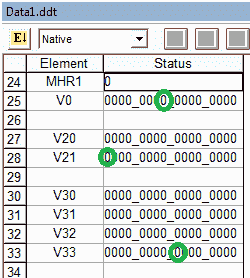 The actual output from each of the shift registers will have to be experimented with during the testing of the program. In our case Sort1 bit V0:8, Sort2 bit V21:15 and Sort3 bit V33:7 was used. 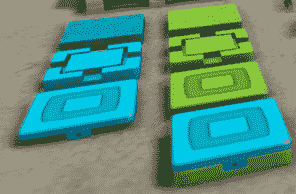 Upon the leading edge of the sorter turners, the output for each of the colour sorting ramps will increment by one (+1). Light will be on when reset pressed. Product Jam at exit Timer. If the sensor is off for more than 5 seconds this will allow the timer to finish and produce an error. This is the end of our program. We will be using Factory IO to test the program. This communicates Modbus TCP Client (Master) to our BRX Series PLC (Modbus TCP Server (Slave)). 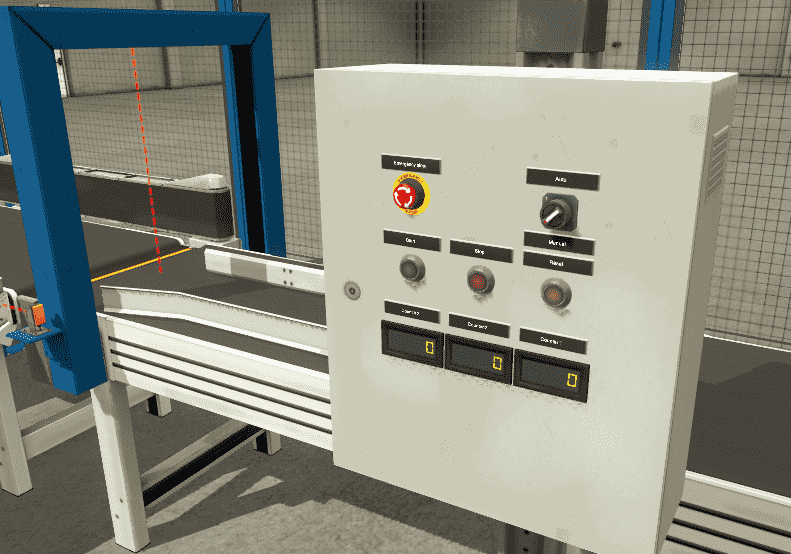 We will now add the inputs and outputs to our program for communication to our scene in Factory IO. The output coils from Factory IO will set the actual input addresses in our PLC. 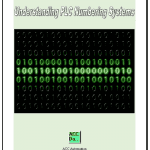 See the following post on Understanding the PLC Program Scan. This will demonstrate how we can set the actual PLC inputs. The inputs from Factory IO will be set by the actual outputs from our PLC. The first step in testing out the program is to ensure that the inputs and outputs of the PLC are wired correctly. We would usually turn each input on manually and see the corresponding input of the PLC turn on. The same applies to the output devices. We would turn on each of the outputs to determine if they have been wired correctly. If everything is working then we will start running our program in automatic mode. Fine adjustments may be required for the output bits of the sequencers. In out example we are using the following bits within each of the sequencer instructions. Test the program for things that can go wrong. Unplug a sensor or remove a box after the sensor has seen it. The program should be able to react. Watch the video below to see an explanation and test of the program using Factory IO. You can download the program and Factory IO scene here. pretty neat. watched the first video. i’ve taken 3 plc courses at a cc in california. 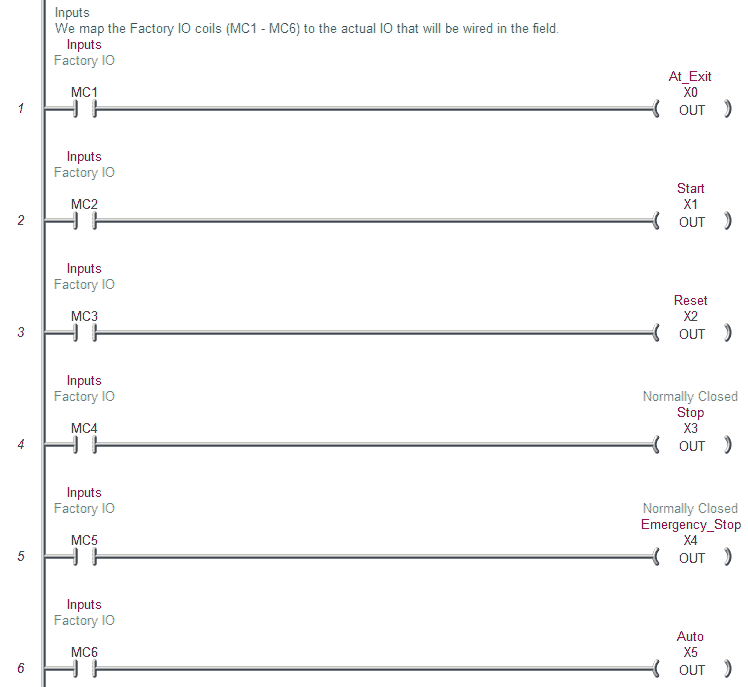 Factory IO is a good program for teaching the basics of PLC programming. Other parts of the program will allow you to make the sensors fault and outputs faults. This way troubleshooting skills can be taught. The first step is to establish communication from the bar-code scanner to the PLC. This is usually done by using a receive instruction in the PLC. Do you have a specific bar-code scanner and PLC models that you are using? This will determine the method of getting the information. The next part to be done is the tracking once the information is in the PLC from the bar-code scanner. I would use compare instructions to determine the destination and then create a shift register. The shift register could be bits like the video above or words. I hope this helps you out. Let me know how you make out. 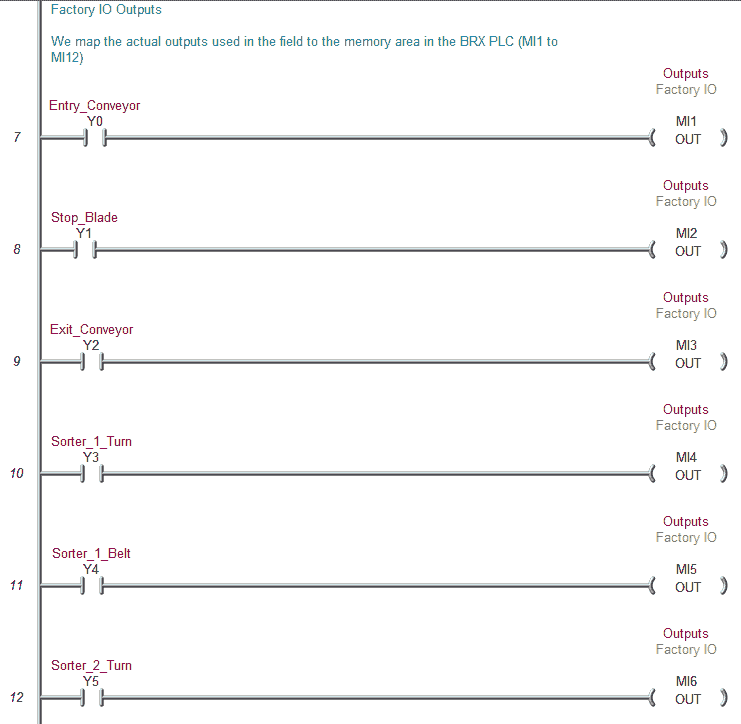 See the comment below for examples on connecting a barcode scanner to the Click PLC and the Do-More PLC. What is the make and model of the barcode scanner that you are using? What is the make and model of the PLC that you are using? Making the cable connection can be difficult for the serial connection. What do you have so far? i wanted to ask for your PLC code you used for the sorting station example. 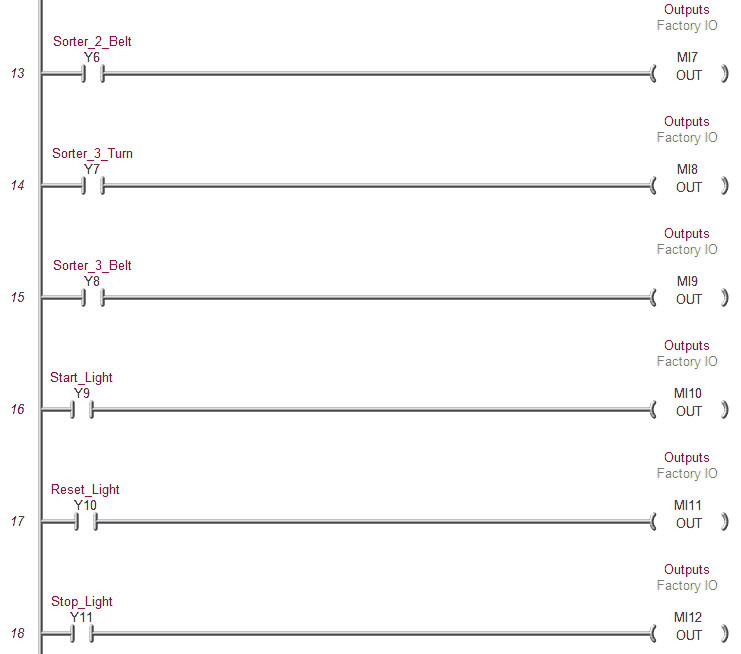 You can add many different shift registers as you would like to represent multiple conveyors. If they are all running the same speed, then the clock pulse would be the same for all of them. Outputs would trigger on each line depending on the location that you want something to happen. l want to use the datalogic DS2100-1110 bar code scanner. 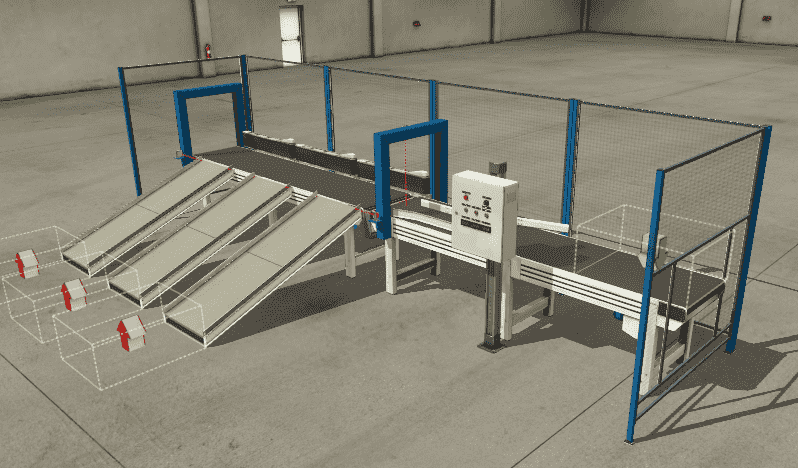 l want to design an automatic parcel sorting machine in which the destination of the parcel is extracted by the bar code and processed by the PLC.once the parcel have reached its sorting area it is deflected to the destination loading bay..the concept is almost the same as the one in your video only that l want to use bar code reader to determine where its being deflected. I have not worked with this barcode scanner but looking at the specifications it should work. It will communicate to the PLC via RS232. The S7-313C does not have a serial port (RS232) so a communication module with a serial interface (RS232) (6ES7 138-4DF01-0AB0) must be used. The first thing to do is to establish communication from the barcode scanner to the PLC. Here are some threads that may help you out. Once your communication link is established, I would then concentrate on the tracking part of the program. This is a nice article. You mentioned the outputs from the shift register were determined by experiment. Is it determined by the location of the three sorters? The output would be based on the timing of when you want it to activate. If the clock pulse to activate the shift register is based on an encoder then you would determine the number of pulses required to trigger the output. In order to have 2 stations running side by side then use two shift registers with the same clock pulse. The input to the shift registers may or may not be the same depending on the application. thanks for your use full examples ,is it possible to test your example without hardware plc in pc and run factory i/o scene . You can connect Factory I/O to the Do-More Designer software. This is a fully functional free download. You can also use AdvancedHMI on the same PC. Here is a post that will cover the installation of the Do-More Designer simulator and AdvancedHMI on your PC. Here is a link dealing with setting up the S7 with Factory IO. Since this program was written for the Do-More PLC you will have to re-write the program for the S7. The shift register for the S7 can be found on this thread. 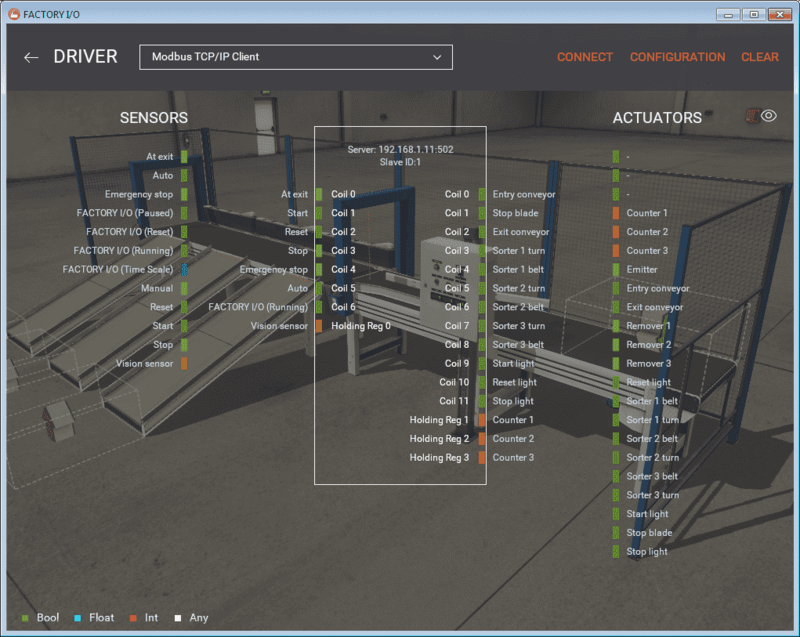 The Do-More Designer Software will program the Do-More Series of PLCs. This includes the H2, T1H, and BRX. The simulator will allow you to run your PLC code without having one of the above physical PLCs. coming back to the sorter system of the code you sent and factory io scene,how do l link the factory io and do more software so that l can run the code. The above links should help you out. can l have your email address so that l can communicate with you more efficiently.l do have some image attachments l will be sharing with you in need of your help. The PLC that you will choose is the DM-SIM. This is the Do-More Simulator. If you were to call up the program that was made for the sorting station, all of the setting should be fine except for the IP address.